Taking a little step back in time today with Hush and some 70s inspiration styling. I wouldn’t say there is one era that inspires my look more than the rest; sometimes I love the 70s for the hairstyles, the 90s for the bra-less looks, and the era we are in right now. I would say my style is an amalgamation of lots of different eras. I like that though, because it always feel like my take on something - like the looks I have here, they are inspired by, but not completely replicating, 1970s style. 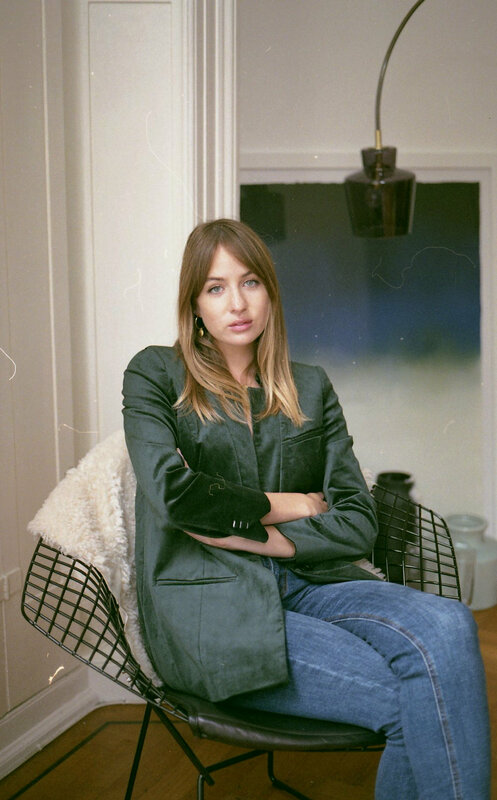 The luxe velvet and emerald green of the blazer, cut longline and tailored just how I like (as we all know very well), styled with a simple white tee, some straight leg jeans and some gold jewellery. Despite having such an extensive blazer collection, this is actually the first velvet blazer I have ever had and I love it, I think it’ll be the perfect evening piece for the Autumn. I also don’t have any other jackets in this colour and now want lots more because it is so flattering! Secondly, something girly for me. This black dress and these pointed flats are such a chic combination that would definitely work for a workwear option too. You guys know I am a fan of a smart flat shoe, but it is normally a loafer and not something as feminine as this! But, I am loving how these shoes look, and while I have gone for it and the girly vibes with his black dress, I think they would look amazing with baggy jeans and a t-shirt. Now something I do find tricky to style, but always love on other people, the midi skirt. I don’t know what it is I find hard about them, because a mini skirt I can style up all day long, but something below the knee and I suddenly struggle. But, here is my attempt(s), and I am pretty pleased with it! Trainers are a must I think if you are going casual, and I love the colour of these ones for autumn, and not surprisingly I have kept everything else simple. The oversized black knit (softest thing ever, Hush do the most incredible knitwear), and the plain white t-shirt for something more warm-weather friendly. I would also love to give this look a go with a skinny turtleneck, because I love how the t-shirt looks tucked in, but love the high neck of the knit with the longer length of the skirt. And as a final note on this one, I recommend going one or even two sizes down with this skirt as the sizing comes up a little large, but every other piece in the post is true to size.